Pieces of Irish dirt are being bought by Irish-Americans so that they can grow authentic Irish roses, or throw handfuls of soil from the home country on their loved ones' coffins. A Belfast entrepreneur, Alan Jenkins, and Pat Burke, an agricultural scientist from Tipperary, have already shifted around $1m (£512,000) of Irish muck to the United States. Jenkins came up with the idea during a visit to see friends in Florida where he heard some Irish-Americans at a meeting of the Sons of Erin, a community organisation for people with Irish ancestry, saying they would like to have some Irish sod placed on their funeral caskets. Soon afterwards he met Burke, who worked at the Irish Department of Agriculture, at a dinner party and the business grew from there. Ach I suppose this would be an opportunity to have a go at Irish Americans and sentimentality about Ireland but sod it! If they want Irish soil and someone is happy to provide it at a reasonable price, who are we to sneer? 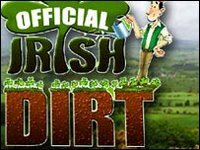 I can understand the instinct to want a bit of the soil from home, but I don't think I'd buy dirt from a Houston bayou bank if I were suddenly transported to Ireland. Of course, Houston isn't exactly romanticized in story and song; hell, we even pronounce the name oddly! Lacking Irish dirt and lacking any inclination to buy some, I suppose I'll make do with the Irish blood in my veins from five or six generations back... even if it's mixed with English, Dutch and French. Musician friends from the Netherlands tell me that by my appearance I could go for a walk in Amsterdam and people would speak Dutch to me... but I'll claim my rightful Irish ancestry even if I don't look Irish. Good one Steve. I wouldnt rush to buy Romford soil either. As for my irish ancestry I am an Irish citizen in that I am entitled to and actually hold and Irish passport. Is this a good idea when you live on an island? The reason you buy land is they aren't making any more of it, and with global warming there's less every year. I'm not sure I'd be sell off the land under my feet unless I already owned someplace to stand on firmer ground. Hmm I had not thought of that, Bryan but I doubt that sales will be so large as to level mountains! Had it been the Maldives then I would be worried!